Spring is a very busy time of year, isn't it? and lots to do in the house. and pulling out our Spring decor. us get new shingles on our roofs. The warmth is here, but only for a little while. You freeze in the shade but stay warm in the sun. I go from warm to cold while being outside. But I so enjoy soaking up the heat of the sun. What plans do you have for Spring? I love poems and I thought I would share one with you today. That in God all things live again! Spring makes my happy, happy, happy! It is my favorite time of the year. I love how everything is coming to life and looks new and fresh. I agree it is a busy time. After being cooped up in the house for so long I am ready to be outside. I giggled at the top quote. It is certainly true. Thankful you have help for roofing. Hubby calls that a knee killing job! Happy Spring to you too,Amy. Love your poem,really pretty. A lovely post today Amy! 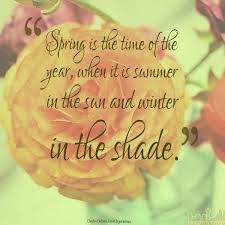 I chuckled at your spring quote... spring in the sun, winter in the shade, oh yes, so very true here too! I hope the nice weather holds up until your roofing can get done, how wonderful that friends and family are pitching in to make it happen! Helen Steiner Rice wrote the most beautiful poetry, and I really enjoyed this poem today! It was nice to see the flowers blooming at the bank, it is warmer in town than here on the mountains. It will be a while yet before I see any blooms here, but that is the joy of spring - the anticipation :) Have a blessed and wonderful week Amy!!! Yes, work and work some more, but we must always make time to rest and enjoy the fruit of our labor! I love hearing the Meadow Larks singing. But the spring winds are a bit much! Hi Amy! Happy Spring to you! I'm glad you're getting your new shingles on the roof, gotta keep those Spring Showers from coming inside to greet you face to face! My yard is just a mess. I have to pull out all the old, dead flowers, cut back the roses and the bushes, rake the blown leaves...yikes! It'll take me quite a while to do, but it's fun too. We had a good Easter celebration. My brother and his family, along with my Dad came to have dinner. It rained, but we were inside anyway! My jonquils are up, but not flowering just yet. Spring is still a bit sleepy, but it's coming!